The groundbreaking book that explains Sensory Processing Disorder (SPD)--and presents a drug-free approach that offers hope for parents--now revised and updated. Over-responsivity--or under-responsivity--to touch or movement? A child with SPD may be a "sensory avoider," withdrawing from touch, refusing to wear certain clothing, avoiding active games--or he may be a "sensory disregarder," needing a jump start to get moving. Over-responsivity--or under-responsivity--to sounds, sights taste, or smell? She may cover her ears or eyes, be a picky eater, or seem oblivious to sensory cues. Cravings for sensation? The "sensory craver" never gets enough of certain sensations, e.g., messy play, spicy food, noisy action, and perpetual movement. Poor sensory discrimination? She may not sense the difference between objects or experiences--unaware of what she's holding unless she looks, and unable to sense when she's falling or how to catch herself. Unusually high or low activity level? The child may be constantly on the go--wearing out everyone around him--or move slowly and tire easily, showing little interest in the world. Problems with posture or motor coordination? He may slouch, move awkwardly, seem careless or accident-prone. These are often the first clues to Sensory Processing Disorder--a common but frequently misdiagnosed problem in which the central nervous system misinterprets messages from the senses. The Out-of-Sync Child offers comprehensive, clear information for parents and professionals--and a drug-free treatment approach for children. This revised edition includes new sections on vision and hearing, picky eaters, and coexisting disorders such as autism and Asperger's syndrome, among other topics. Carol Stock Kranowitz, M.A., is the author of The Out-of-Sync Child Grows Up, The Out-of-Sync-Child, and The Out-of-Sync Child Has Fun. She is also the co-author on Growing an In-Sync Child with Joye Newman, M.A. She has been a preschool teacher for more than 25 years. She has developed an innovative program to screen young children for Sensory Processing Disorder, and writes and speaks regularly about the subject. She has an M.A. in Education and Human Development. 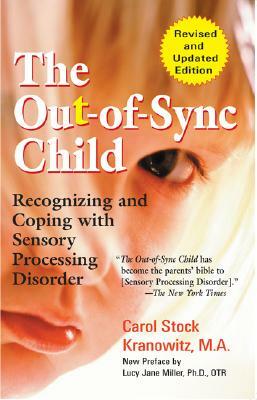 "The Out-of-Sync Child has become the parents' bible to [Sensory Processing Disorder]."